FAIRHAVEN, Mass. — Southcoast Health announced today that the Southcoast Centers for Cancer Care will host the 9th Annual Shine a Light on Lung Cancer vigil on Thursday, November 16 at 6 p.m. at the Southcoast Centers for Cancer Care at 206 Mill Road in Fairhaven. Southcoast Health joins 200 other communities across the country to host this event as part of a national movement created by the Lung Cancer Alliance (LCA). It was created to provide hope, inspiration and support to the thousands who are diagnosed with lung cancer. Lung cancer patients, survivors, family members, caregivers and the community are invited to join Southcoast Health for this very special vigil. Dr. Tammy Gleeson, Southcoast Health thoracic surgeon and lead physician for the Lung Screening Program, will serve as the emcee for the event. The speaking program will include personal stories from survivors and lung cancer experts. 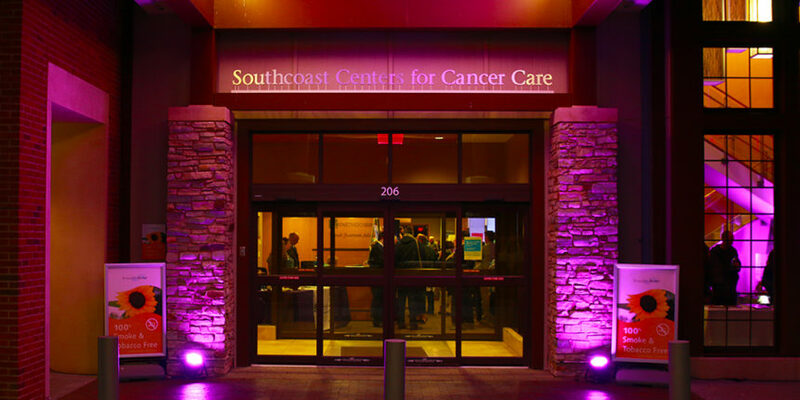 At the end of the speaking program, the exterior of the cancer center will be lit in purple lights and guests will illuminate glow sticks in honor of survivors and in memory of those who have passed. There will also be entertainment provided by local musician Michael Couto. This free event is open to the public. Light refreshments will be served. Registration is required. Visit www.southcoast.org/shine or call 877-822-2732 to RSVP. For more information about the event, please contact Kathy Tsonis, Cancer Outreach Coordinator, at 508-973-3077. For more information about Shine a Light on Lung Cancer Vigil, visit http://www.lungcanceralliance.org/shine-a-light-on-lung-cancer/.